I agree, this looks like a bunch of fun. After a bit of playing about on a private server I have designs for lighting that can be switched off & concealed. a entrance hidden behind a waterfall that cuts off both the waterfall and removes the blocks from the back to show a doorway. an infinite 2 wide corridor of squishy. and a few other things. ... I may have to modify my fortress. EDIT: seze if I hop on the pandora server now can you teleport me off the roof of the nether? I've been stuck up on a bedrock plain for the last month. They are both up. I can connect to the main server no issues, and get an outdated client on pandora, which shows they are both "up". Can't tell if pandora crashed out or not since I haven't updated my client yet. Key'ìl Nekxetse on "The Revolutionists"
The program life received signal SIGSEV. Core dumped. 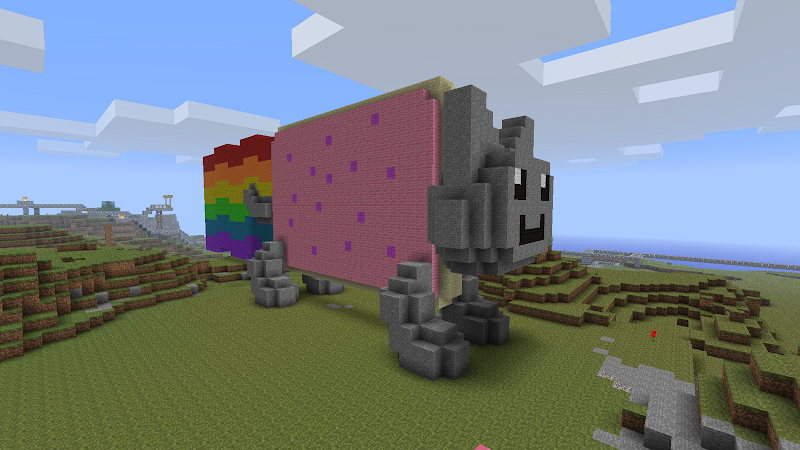 Now add the nyan cat's song using looping note blocks. My new project, will take some time to complete, but it will be epic. Srake serar le'Ìnglìsìa lì'fyayä aylì'ut? Nari si älofoniru rutxe!! Thanks for the catch, did not even noticed. Not everything is perfectly the same but that's practicly impossible. it's a bit bland but other than that cool. It wont be completely the same, cause sizes are not exactly correct, but I'll make of it what I can. And try to make it as good as possible.